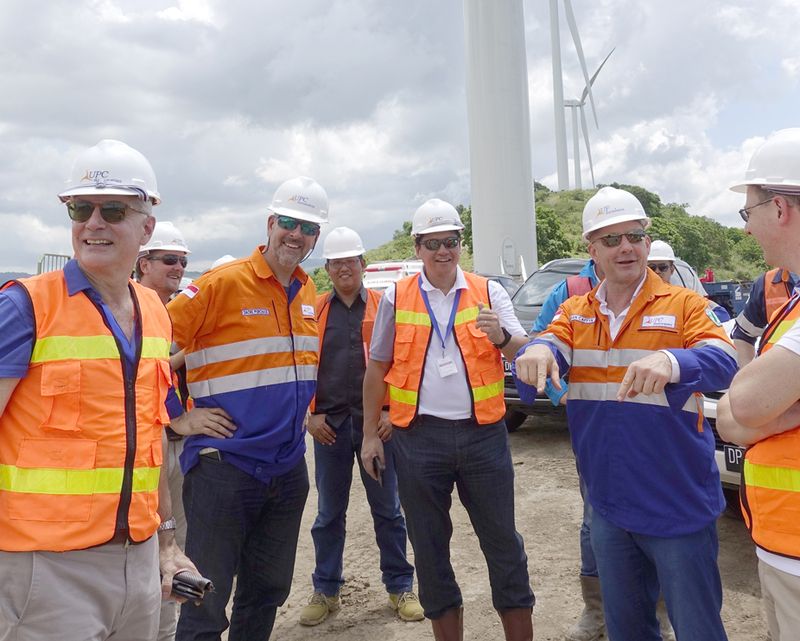 Ayala Corporation President and CEO and AC Energy Chairman Fernando Zobel de Ayala, together with the top executives of AC Energy and its partner UPC Renewables, visited the site of the 75-MW wind power project in Sidrap, South Sulawesi, Indonesia on November 8. The Sidrap project is the first greenfield offshore investment of AC Energy through its affiliate, AC Energy International Holdings Pte Ltd., a Singapore private limited company. It will also be the first utility-scale wind farm project in Indonesia when it begins commercial operations in the first quarter of 2018. AC Energy and UPC Renewables are also partners in North Luzon Renewable Energy Corp., the owner and operator of the 81-MW Caparispisan wind farm in Pagudpud, Ilocos Norte. The Sidrap wind farm, estimated to cost $150 million and being developed under PT UPC Sidrap Bayu Energi, has already gained the notice of Project Finance International, a global publication that included Sidrap as “Smart Project” in its list of Asia Best Practices Citations. Sidrap wind farm, Indonesia’s first utility-scale wind farm, is expected to commence commercial operations in the first quarter of 2018. AC Energy has been expanding its footprint in the Southeast Asian region. Apart from Sidrap, it also has a 20-percent stake in Star Energy (Salak-Darajat) B.V. which acquired Chevron’s geothermal operations in Indonesia. The acquisition was a major milestone for the company as it plans to scale up its renewable energy portfolio to 1,000 MW and reach its net income target of P5 billion by 2020. AC Energy is also looking at Vietnam to make its second regional investment after Indonesia.